Sewing a casing and inserting elastic can be fiddly and tedious, especially when using a narrow width elastic. But there’s an easier, quicker way to create a elastic waist without using a casing at all. It instantly creates a fitted waist, giving the dress (and you!) an hourglass shape. The result is a very finished look that can be worn with or without a belt. I've used narrow elastic to gather a waist a number of times before but recently came across it when I was sewing my Sailing Dress (Vogue V1344). The instructions said to make a small casing using the seam allowance at the waist and then thread the elastic through. I thought that was too fussy and just stitched the elastic directly to the seam allowance. You can see above before the elastic was applied on the left and after on the right. Pretty great transformation, isn't it? All you need is a length of 1/4 inch elastic and a sewing machine. For a dress without a seam at the waist, stitch the elastic directly to the fabric. If the dress has a waist seam, stitch the elastic to the interior seam allowance. The instructions here are for applying elastic to the waist of a dress but this method could be used for the back of a bodice, the hem of a sleeve or as a decorative element on a bag or headband. Step 1: To determine the length of elastic you need, wrap the elastic around your waist (or where the elastic is going to sit on the garment) and adjust until comfortable. Cut elastic to the desired finished length. Step 2: On the inside of the garment, use a pin to mark the center front, center back and each side seam. Fold elastic in quarters and place a pin at each point. Step 3: Place one end of the elastic at a side seam and pin in place. Bartack elastic end in place with a wide zig zag stitch. 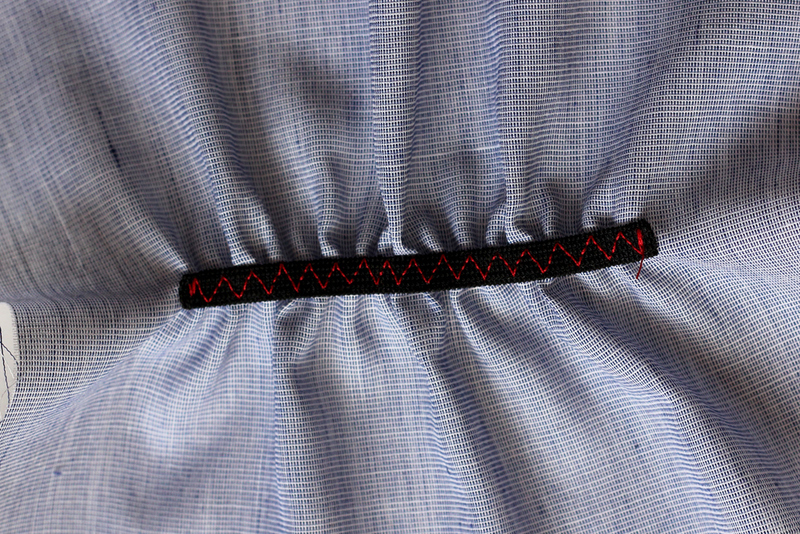 Step 4: Switch machine to an elastic stitch with a stitch length of 2.0. This stitch looks like a zig-zag but has three stitches in each zig/zag. Step 5: Match the next pin on the elastic to the next pin on the garment and secure. Stretch elastic to fit fabric. Holding the elastic in a stretched position, stitch with elastic stitch until you reach the pin (center front or back of garment). Step 6: Match the next pin on the elastic to the next side seam. Stretch elastic to fit fabric and stitch. Step 7: Continue this process until you reach the end of the elastic. Bartack the end in place. Cut threads. This is a really easy treatment and practically invisible when you use matching thread. The trickiest part is probably holding the elastic in the stretched position but you'll get the hang of it in no time. It's important to stretch the elastic while stitching so that the fabric will shrink up and look gathered when you're done. I hope that this is helpful to you. Let me know if you have questions.